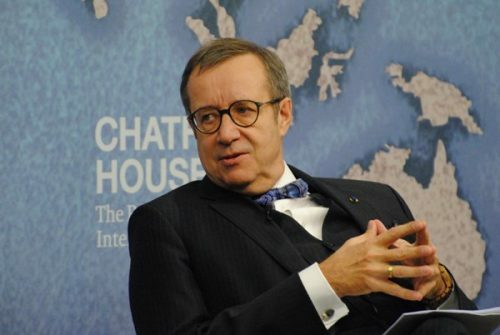 Last week, President of the Republic of Estonia Toomas Hendrik Ilves, who received World Leader in Cybersecurity Award 2017, shared lessons and experience in building a successful e-government and digital society with VietNamNet, one of the first online newspapers in Vietnam. “Estonia is one of the least corrupt countries in Europe, compared to the other Western European countries. I think that Estonia’s control over such low levels of corruption is largely due to the effect of enhancing transparency through computerization,” said Toomas Hendrik IIves, former President of the Republic of Estonia. LTS: On the afternoon of May 14, Prime Minister Nguyen Xuan Phuc presided over a meeting to promote the establishment of e-government in Hanoi. At the meeting the Prime Minister said, “Setting up a system for sharing data among state administrative agencies as soon as possible towards the direction of decentralization deriving from the lessons of Estonia and France. It is a suitable solution for Vietnam in the context of having too many information systems at all agencies but cannot connect with each other.” Vietnam Weekly Reporter interviewed former Estonian President Toomas Hendrik IIves about lessons and experience in building a successful e-government and digital society. – As a small Baltic country with a population of nearly 1.3 million people, Estonia is now among the world leader in information technology. During your presidency from 2006 to 2016, how in just ten years, from a poor, backward country, Estonia had developed a platform in the high technology industry so powerful? Mr. Toomas Hendrik IIves: It all began in the early 1990s when Estonia faced the urgent need to rebuild the country. We are fortunate that we have a lot of young people who share the same idea that starting technology is the way to go. The idea I conveyed to everyone at that time was that Estonia would take about 50 years to get out of its backwardness in all areas: from construction to infrastructure, transportation and education. The most important moment to me back then was Marc Andreessen at the University of Illinois Urbana-Champaign launching the first commercial website browser, as there had never been a website browser before. I was very tech-savvy, I went to buy a small box to attach to the computer from where to explore and explore. After experiencing this technology, I realized that this is the area my country needs to focus on despite the fact that Estonia is full of obstacles, i.e., the legacy of the old regime. I was analyzing with my colleagues at that time, Estonia is almost left behind by almost every other country in almost fields. If we focus on developing the IT sector now, then Estonia can compete in the global race, closing the gap behind. Estonia took off from there, all across the Estonian state, engaging in Information Technology to challenge itself, to be free of the gloomy atmosphere that was covering the country at the time. I would also like to share with you, as the strategy of focusing on information technology, we encountered many objections at the time. Some people think that it will take more time. Especially with the notion of ​​computerizing and connecting the Internet across schools, throughout the year, not a single week has passed that we were not led to believe that this idea wasted money and time. – Estonia’s wealth of technology has made Estonia a pioneer in the field of e-government since its establishment in August 2000. In 2002, Estonia used its electronic ID, which allowed people to access a myriad of public services on websites (such as social security, police, education, etc. ), as well as ensure that e-government gateways and data are protected. In order to have successful technological applications in managing, becoming an e-government like that, how did Estonia start? And when there are difficulties? Mr. Toomas Hendrik IIves: First of all, we make Internet connections to schools and provide volunteer support programs. Since there is a high demand for computers in schools, we have a city policy, or a higher level government is willing to support half the cost. When banks find that the benefits of networking with customers, the elderly and especially those in rural areas are cost-effective, and that it is rather costly for them to open a small branch in each locality with insufficient infrastructure and unaffordable labor costs, then the banks have actively participated. Many volunteer organizations have traveled throughout the country to teach people how to use computers. This is the first step to help raise awareness and skills needed to perform online banking operations. We also develop online access to public services at all levels of government across the country. These initial signs indicate the urgency of an e-government, as we study more seriously and thoroughly to make breakthrough improvements in the field. It is fortunate that we have the same passionate and knowledgeable technologists, who share the same thoughts about an electronic society. By then people would have thought it was a great idea. So all together build up, combining technical expertise and policy-making to move from concept to reality based on law, policy and mechanism. – The world has also referred to the success of the Estonian state when successfully applying the online system of taxes payment. Electronic tax has become a norm, 94% of Estonians have online records, which are taxed and paid online. Could you share this model? Mr. Toomas Hendrik IIves: We usually settle taxes in March. Every citizen or business logs in to his/her account and the system displays all activities you have worked on in the past year. No matter how big a small company you are, in one or more locations, tax issues are here. All earnings are reported and can be viewed on this portal. You can make a tax payment right here. Tax deductions are also automatically made in the case of having children under the age of 18. Then, if everything looks right, hit enter, all done in 3-5 minutes. If you pay your taxes online, then you will receive a tax deduction within a week, and the system will pay directly to your bank account. I think that encouraging governments to implement this strategy of digitization is a significant increase in compliance. People are willing to pay taxes if it is easy to do so. This system also makes fraud more difficult or even impossible. Although we only have a fairly simple system, our citizens like it in all cases. The Estonian people, who stay or work abroad, all remember and really appreciate our online tax system. – Another success that proves Estonia’s technological prowess is the online voting system. Early in 2007, Estonia planned to become the first country in the world to allow voters to participate in the election of Congress via the Internet. Could you share some of this system? Mr. Toomas Hendrik IIves: That’s right. Estonia currently has about 30-40% online votes, equivalent to about one third of the total. In the first year, we did 5%, then increased, and now maintained stably in the last 3-4 elections. Online voting has a special effect on the Estonian community abroad because otherwise you can only vote in certain places like the Embassy. With geographic features of a small country, we cannot have many Embassies everywhere and Estonian people live around the world. Even if you are in the United States, you can only vote at the Embassy in Washington D.C. or consulate in New York. But now you can vote online, in California. When the online voting system was first launched, there were a lot of concerns. Many people said that they did not trust the system and many other things. But it’s not so because online voting is also similar to the traditional one, which of course can easily be cheated with redemption votes. The voter registration list is not as secure as the registration list in the system. – What are your advices for Vietnam from the successful experience of building e-government for Estonia? Mr. Toomas Hendrik IIves: First of all, what we have done and succeeded is letting children get acquainted with computers. We studied and found that innovation in education will take 15-20 years to bring efficiency. But children should begin to get acquainted with computers as early as possible. Then consider the next step, as I mentioned above, we need to develop electronic IDs so everyone can connect safely and think about developing platforms that can provide a variety of services. It is also very important that computerization or digitalization can meet the demands of people. Computerization of public services will be meaningful to the government as it makes things more efficient. People will not join if they do not like it, so our duty is to make them love it such as they easily pay taxes, get easy access to medical care and medication. Working with the bureaucratic structure can be a horrible experience in most countries if you computerize this system, but then we’ll recognize that we have already wasted so much time for these things. I always support the use of electronic IDs like the way Estonia has been doing when applying technology to day-to-day life. In addition, there are more options now. What I actually want to recommend is to visit the World Bank website, then search and read a 400-page book called Digital Dividends 2016 by Kaushik Basu, economist leader of World Bank. You will see a large number of studies have been done. Find out what the importance of digitalization because each country is different and you can find a series of solutions there. Estonia is one of the least corrupt countries in Europe, compared to the other Western European countries. I think that Estonia’s control over such low levels of corruption is largely due to the effect of enhancing transparency through computerization. Had we not have done so, we would not have been able to achieve a strong IT industry based on a good economic fundamental. Besides, we were perhaps the only country in Eastern Europe that was not affected by the migration problem. Some people left the country but many others returned. Estonia is not being brain-drained. Estonia would have been different today had we not have done what has been done in the past few years. Former President of Estonia Toomas Hendrik IIves was the leader of the Social Democratic Party in the 1990s. He served the government as Minister of Foreign Affairs for the first term from 1996 to 1998 and a second term from 1999 to 2002. From 2004 to 2006, he was a member of the European Parliament. He was elected President of Estonia on September 23, 2006. He was the fourth President of Estonia from October 9, 2006 to September 10, 2016. Former President Toomas Hendrik IIves was honored by the Boston Global Forum (BGF) as World Leader in Cybersecurity on December 12, 2017. He was honored for outstanding achievements during his ten years of presidency (2006 – 2016). He set up a defense strategy on the Internet, making Estonia a leader in information technology, cybersecurity, and in particular the successful construction of e-government.